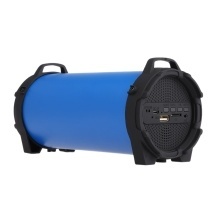 Smalody SL-10 is a high-quality outdoor BT speaker, with cylinder-shaped appearance and powerful sound. Adopts advanced BT 4.2 technology, range more than 10m, you can easily connect with almost all BT-enabled devices. It also supports FM radio, TF card, U drive and 3.5mm AUX IN music play; with a microphone, you can enjoy hands-free calls. With an adjustable webbing strap, easy to carry outdoors. High capacity rechargeable 1200 mAh lithium battery supplies up to 4 hours of playtime at 2/3 volume on a full charge. Deep bass 10 watts HD loudspeaker with 2.5" premium driver provide you with crystal clear sound and strong bass without distortion even at highest volume. Via the TF card slot, 3.5mm audio port, and USB port, you can connect the devices without BT function. Built-in microphone lets you enjoy hands-free calls; built-in FM Radio, perfect for travel and hiking, super light and easy to fit in your backpack, baggage. With an adjustable webbing strap, easy to carry outdoors. High capacity rechargeable 1200 mAh lithium battery supplies up to 4 hours of playtime at 2/3 volume on a full charge.